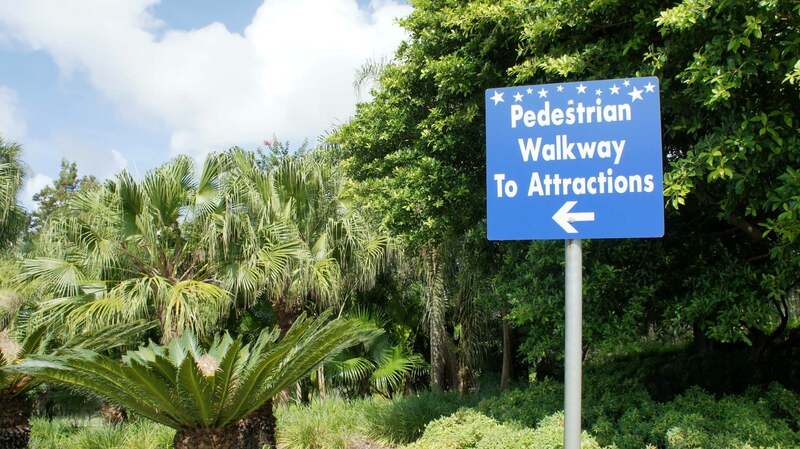 Walking path from the intersection of Kirkman Rd and Major Blvd to Universal CityWalk. There are two groups of hotels within walking distance of Universal Orlando Resort. One group is located on Major Blvd, across Kirkman Rd from the resort area. The second group is located along International Drive, across Interstate 4 from the resort. In this post we will be taking a closer look at exactly what it looks like to walk from the first group of hotels, the ones on Major Blvd, to Universal. To start, take a look at my custom-made Google map below. Remember, you can click any marker to display the attraction or venue name. To scroll or zoom, use the controls on the top-left of the map. You may also switch to different map views by using the buttons on the top-right of the map. View Universal Orlando Partner Hotels within walking distance. Holiday Inn and DoubleTree at the Entrance to Universal — the red and aqua placeholders with pinholes — are absolutely the closest off-site hotels to Universal Orlando. While they both provide “scheduled” shuttle service to the Universal’s transportation hub, as you can see by the map it really isn’t that far to walk. In fact, it only takes about 15 minutes to get from the intersection of Kirkman Rd and Major Blvd to the Universal CityWalk entrance (it’s about three-quarters of a mile). So when you consider that you’ll be walking for six to eight hours through the theme parks anyway, what’s another few minutes? Best of all, if you walk you can do so on your schedule. No waiting or rushing or getting reservations for seats. Don’t be too discouraged. Dozen of intrepid families cross this intersection each day, and I myself have done it several times. Follow the traffic signs, use a little common sense, and you should be just fine. Once you get across Kirkman, the walk is a breeze. You simply follow Major Blvd to Universal Blvd, cross that intersection, take a left (there’s a sign, the one at the top of the post), and follow the path to the valet area, up the stairs, and into CityWalk. You can see the entire journey in the photo tour below. IMPORTANT If you are coming from Holiday Inn or Hyatt Place (which is right next to Holiday Inn), be sure to cross over Major Blvd to the DoubleTree side before you cross the eight lanes of Kirkman Rd. Even though there is no crosswalk going across Kirkman Rd on the Holiday Inn side, for some reason guests occasionally end up crossing Kirkman from over there. This is bad news because, if you do this, you have to walk on the street, against opposing traffic barreling out of the Universal parking garage, to get down to Universal Blvd. In other words, follow the traffic signs and use a little common sense before crossing Kirkman (did I mention that already? ).